Motto: Nemo Me Impune Lacessit - "No One Assails Me With Impunity"
If you are planning or thinking about leaving the Scots Guards or have already have done so, then contact us today and we can give you advice and contact employers suitable for your skills and experience. Let us help you take the first steps to a new career. The Scots Guards (SG) is a regiment of the modern British Army and is part of the Guards Division. Originally called the Marquis of Argyll's Royal Regiment, founded by Archibald Campbell, 1st Marquess of Argyll in 1642 for service in Ireland, by the order of King Charles I of England and Scotland. After a number of years in Ireland the regiment was assigned to take part in their first major conflict,the English Civil War, more specifially against 1st Marquess of Montrose, James Graham, who fought on the side of the Royalists. In 1650 under the reign of King Charles II, the regiment became the Life Guard of Foot of His Majesty King Charles II. 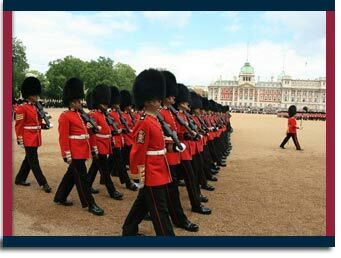 In 1661 after the king came back to England after exile, the regiment was reformed and named the Scottish Regiment of Foot Guards. In more recent times, the Scots Guards were involved in various British Army conflicts including the Battle of the Somme in the Fisrt World War, Battle of Monte Cassino in the Second World War and the Battle of Mount Tumbledown in the Falklands War. Since 2008 the main regiment resides in the largest garrison base in the British Army, clled Catterick with a population of around 12000. Though since 1993, a seperate company called F company is based in Wellington Barracks in London, next to Buckingham Palace. They preform there many public duties including Trooping Of The Colour. Within the Household Division the Scots Guards can be seen in the ranks as the third division of the Guards Division, thus their tunics have their buttons spaced out in threes to signify this. The Colonel's Fund of the Scots Guards has reached a fantastic sum of £1,400,000. The fund provides support for soldiers killed in action or who are wounded on operations, also giving help to their families. For more information goto to the Scots Guards Colonel's Fund Website.